Inspirational people have many common attributes such as courage, perseverance, positive mindset; dedication and passion are just some to be mentioned. Those who are gifted with these wonderful attributes are commended for using them for the positive benefit of others and for those who don’t naturally have what it takes to be an inspiration, all is not lost. Taking the time and trouble to observe some notably inspirational people can prove to be a great learning curve. By observing some of these inspirational people one can learn to pick up pointers on how to inspire and prepare one’s self to be better equipped to face any potential situation that presents itself. The ability to be able to react positively and inspire others to do likewise is the main aim of being an inspiration. Scientific research has proven that every individual has the capability to react positively to any given situation, however the trick is to know when and how to harness this inner attribute and bring it out for the positive benefit of others. In depth studies have commonly shown that inspirational people very rarely see the negative elements in any given situation but rather tend to focus on the positive or how to change a negative to a positive. This particular mindset is very much a dominating feature in the makeup of inspirational individuals. In the course of wanting to pursue this positive quality, reading and listening to these individuals as much as possible is a step in the right direction. As the title suggests Nick is indeed limbless. Being born this way and not the result of any catastrophic accident. Nick has never known the advantages of having all limbs but instead has had to live and become the person he is today because of this. Having a difficult childhood because of the limbless condition could have ended in tragedy if not for the support and love of his parents. Experiencing the many trials and tribulations is probably the motivating factor that eventually caused Nick to re-look at his seemingly pathetic existence with new “eyes”. This of course is the biggest and most important hurdle to cross. Upon coming to the realization that he could change things and that it was not the end of the world to be born limbless Nick took the next important step to work on changing his mindset. This turning point decision is what eventually brought Nick to the fore front of society, to be known as one of the most inspirational people alive. Though Nick credits his strength to overcome adversity to his faith in GOD, his inspirational qualities have been widely recognised by all quarters of society whether religious or not. Perhaps finding the purpose of his existence was the contributing factor and pivotal point for the successes eventually experienced by Nick. One of his first forays into the world of inspiring people was to embark upon becoming a motivational speaker. Sharing his testimony and how GOD impacted his life served as a launching platform for his motivating speeches. Those having the good fortune to attend or witness such powerful and very real experiences being shared came away being undoubtedly enormously inspired. The most overwhelming fact that Nick often points out to his audience is that anyone and everyone can be used to be an inspiration to others. His theory lies in the fact that if GOD can use him, a limbless individual, what excuse do other more “complete” beings have to avoid being an inspiration. Being a survivor of a catastrophe and then having to struggle to live without recourses can be a very difficult experience to say the least. Nando parrado was a survivor of an air crash who managed to survive a further two months in the cold mountains of the Andes. Even more amazing is the decision he made to get help knowing the chances of finding or even surviving the quest would be slim indeed. This is a clear example of an individual being able to stay positive and focused on one important fact which is to survive. The human body and mind can be conditioned to achieve unbelievable feats if the mind set has the proper motivation. With the correct motivational mindset, Nando was prepared only mentally to face the overwhelming challenge of surviving and finding help. Due to the miraculous success of Nando’s survival against all odds, he is now recognized as an internationally respected speaker. He has managed to develop a successful doctrine of strategies for unlocking potential and excellence an individual’s work life and personal life. The strategies include various ways of addressing the everyday struggles with the best motivational mindset exercises benefiting all involved. Nando has also been honored in various other platforms for his dedication towards the motivation techniques and for being the encouraging factor are many people’s lives. Selected as the keynote speaker for the International Association of Speakers Bureaus and also the keynote and closing speaker for the National Speakers Association. Trying to get the message of survival against all odds is perhaps the key to most of his motivational styles. There are circumstances in every individual’s life experiences that call for the unprecedented strength and courage to explore the impossible with a positive mindset. Only this positive mindset can help keep an individual focused on the successful outcome. Finding out one has a terminal disease is no reason to stop living. That is what Randy believed in and it showed clearly in the way he handled the news of having being diagnosed with pancreatic cancer. The doctors did not paint a pretty picture and in fact did not hesitate to inform Randy of the short time left before he would have to face the unflattering effects of the disease, but true to his positive thinking nature, Randy decided to make the best of an ugly situation. Perhaps known more for the unforgettable lecture titled “The Last Lecture” than his teaching skills, Randy left an impactful impression on all those who were privileged to be able to hear the lecture. This clearly shows the positive mindset of this individual to make the best of whatever time he has left. Many people have since managed to also make the effort to look on the brighter side of their individual situations because of the inspirational lecture. Individuals and more specifically academics are requested to explore in-depth the things that matter most to them and how they would then try to impart this information deemed important to the rest of the world. This exercise when applied to the individual’s circumstances and sometimes enable the individual to realize that the particular predicament though daunting may not be as dreadful as first perceived. This exercise is of course beneficial to those who may then be able to realize that their individual situations are not as bad and solutions can be found and success can be achieved. The predominant factor to be understood is the cultivation of a positive mindset. By finding the motivation to pursue solutions rather than just accepting the problems is perhaps the gist of the challenge Randy puts to everyone. Most people today expect things to be easy and prefer to exert very little effort to achieve anything. However there are those that manage to achieve phenomenal feats even when faced with unimaginable adversity. Liz Murray one of those people who managed to do just that, in spite of the circumstances. From the very start the challenges were ever present in Liz Murray’s young life. Having parents who were drug users and eventual HIV positive individuals did not present Liz with very many positive options in life. To further complicate matters most of Liz young life was spent as a homeless person. However where most people would just give up Liz Murray called on the inner strength to motivate herself to create a better life instead of just sitting back and allowing life to take its course. Making the decision to pursue an education was one of Liz Murray effort to carve a better life for herself. The fact that she had started high school later than most did not deter her from achieving her end goal and she stayed focus on educating herself. Perhaps the turning point of her life was when she began attending the Humanities Preparatory Academy. In spite of the burden of having to care for herself and her sister, and the fact that they were homeless did not stop Liz from graduating within a short period of two years. This lead to her being awarded a New York Times scholarship after which she was accepted into Harvard University. However adversity struck again when she had to leave Harvard to look after her now dying father, but even this did not dampen her ambition and she enrolled in Colombia University to continue her studies, which was nearer to her father. It was during this time that Liz also started motivational speaking sessions and sharing her experiences with others. Here is another incredible individual who has been able to survive against what most would term as impossible odds. Sean Swarner beat not one but two cancer scares and came out the victor and champion both times. Being first diagnosed at the young age of 13 with Hodgkin’s disease and then later finding out that he had Askin’s Sarcoma too, is indeed more tragic new than anyone is expected to bear. However Sean had made up his mind not to let the diseases dictate his life and destiny from a very early stage. The documented fact that he was the only person in the world to have both diseases at the same time did not in any way deter his determination to beat both conditions and get on with living his life. He survived both deadly conditions with only one fully functioning lung. The other lung had to be removed because of the huge tumor that was detected due to the Askin’s disease diagnosis. He has since been featured on many media platforms to help promote awareness of cancer and as a testimony to the possibility of beating the disease. Beside this Sean has also established his own foundation called the Cancer Climber Association which promotes cancer awareness and helps to raise funds for cancer research. In his book titled Keep Climbing, he recounts the varies stages of the struggle and journey from the very depths of his near death points to his eventual victory, his experiences at the peaks and his desire to stay at the top of the world. This is evident in his ability to complete the Ford Ironman World Championship in October 2008. Staying positive and motivated throughout the fight to stay healthy perhaps contributed to the phenomenal success rate he had in not only beating the disease but keeping it at bay. How does fear hinder or help us grow? Dread comes in two forms. The first fear may be good for you, when your innate instincts guide you to stay away from dangers. On the other hand if your fear stalks you, then you need to readapt your thinking habits, as this is an unhealthy dread. The only way to face your fear is to realize that change is what helps you to grow. The point here is to work on building self-determination; you must accept change and overcome any negative fears to become your own super hero. 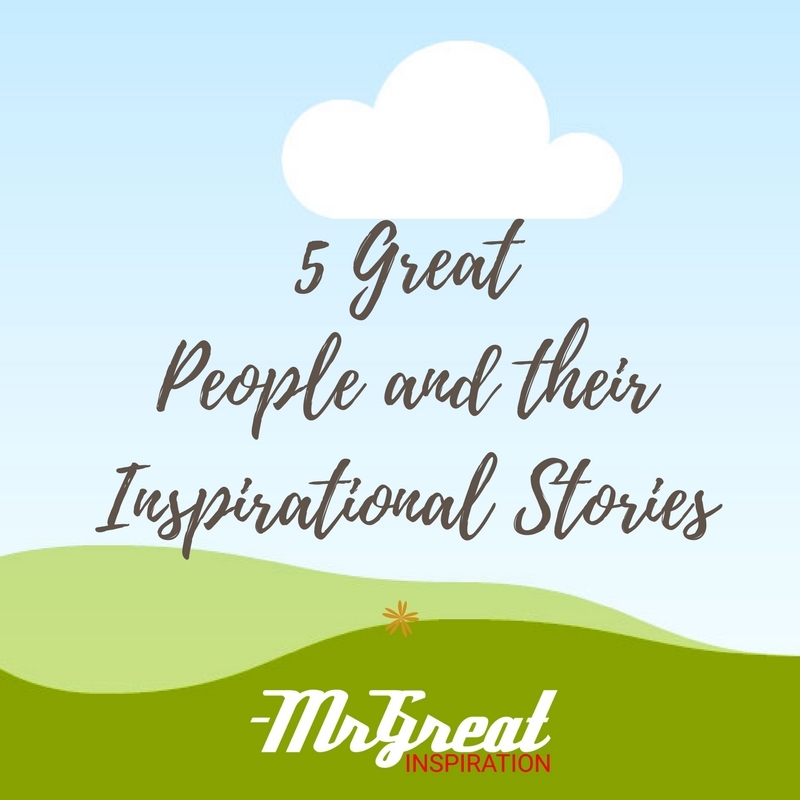 We hope guys you find our article "5 Great People and Their Inspirational Stories" by Mr Great Inspiration useful.